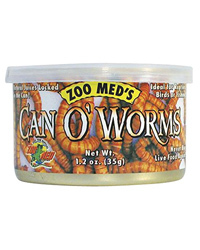 Zoo Med's new Can O' products are the latest in reptile nutrition and convenience. Our full line of feeder insects are cooked in the can (called "retorting") which locks in the flavour and freshness while also softening the exoskeleton for easier digestion. Ideal for lizards, turtles, and birds. A little bit greasy but my turtles still love these too. They sink to the bottom of tank so they can play catch the worm. The birds in my garden love these. Bought them for my reptiles, but the birds are sharing them now aswell! Good as can buy several cans at a time to save on postage, and then just open them as I need them.